With the California Pipe Flow Metering Method the discharge from the open end of partially filled horizontal pipes discharging freely into the air can be measured. The equation is empirical and can be used for pipes in the diameter range 3 - 10 in. In the discharge on a horizontal 4 inches PVC sewer pipe the distance from the top inside pipe to the water flow is 3 inches (0.25 ft). The inside diameter of the PVC pipe is 4.069 in (0.34 ft). Engineering ToolBox, (2017). California Pipe Flow Metering Method . 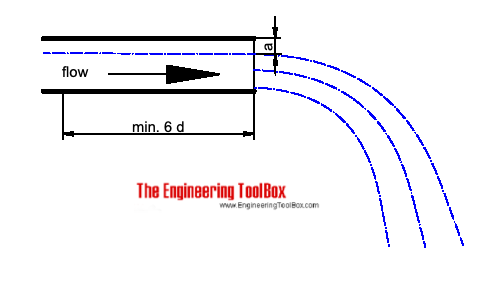 [online] Available at: https://www.engineeringtoolbox.com/california-pipe-flow-metering-method-d_1975.html [Accessed Day Mo. Year].